A common mistake for inexperienced beekeepers is to assume, too soon, that the bees have made it through the winter. The sight of spring flowers and bees visiting them, makes the keeper think the bees will now survive until Spring, sadly this is not always true. Cold nights limit the hour's bees can work. They cannot start until it warms up, sometimes not untile late morning. Plus frosts may actually kill the blossoms, so bees can get no benefit from them. Overcast skies may prevent photosynthesis and can reduce nectar production. Often times, the first real nectar flow is quite awhile after the first spring flowers appear. It generally takes sustained warm weather and plenty of sunshine for most flowers to yield nectar. At the same time, food requirements within the hive will have increased exponentially, as the bees raise large quantities of brood for the future workforce, to bring in the spring nectar flow. It is very easy for your hives. 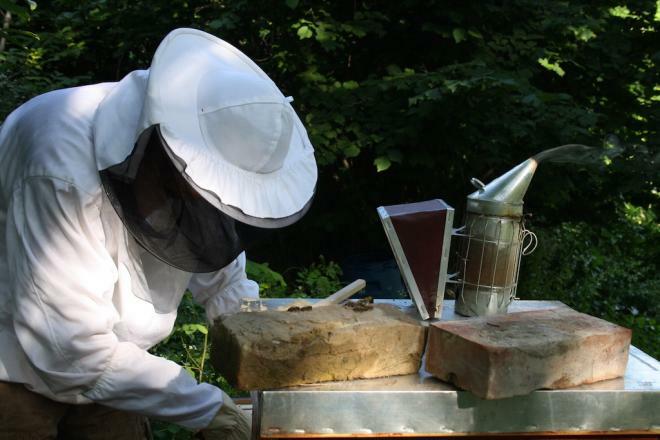 This challenge can affect both smaller colonies but also your the strongest and best hives. It is a sad sight to see a powerful hive die or be devastated by starvation, just as they had begun building up food reserves. Check, check, check your hives! At this time of year, never assume! Hives that were heavy with stores a month before may now be close to starvation. Check, check, check! Don't let the spring build up falter for even a day. Even if they survive, the colony has lost its spring flush of growth. The spring divide you could have made delayed and you may have also lost the ability to bring in a spring honey crop. A brood appears undamaged may actually be chilled or even dead, because the bees did not have the energy (or population) to keep it warm. In evaluating the food reserves avoid counting nectar/honey that isn't capped, because it can disappear in a day or so. If you have hives with no capped honey, feed! And be quick about it. You can feed sugar fondant through the Winter at anytime but avoid syrup until the warmer Spring weather begins as this will stimulate egg laying by the queen and could again cause chilling of the brood. Day by day race for the bees! Sometimes the tail end of winter turns into a day by day race for the bees, to see if they can hold on until the real nectar flow gets going. You may find hives that are really busy on a nice day in early March, are completely dead by the end of the month, just a week or so before they could have made it. Finally if the worse should happen and you lose a colony through what appears to be starvation and you're not going to immediately clean the colony out and take away dirty frames and clean out all the dead bees, please note that you need to block up the entrance to make sure that other bees can't get into the hive and rob it. If there is some kind of disease in there, you don't want to spread it either to your other colonies or local area. With a little preparation and a watchful eye you will ease your bees through the last days of Winter and into a bright and warm Spring and enjoy the fruits of your hard work into the new season and beyond. This article was edited by Stewart from The Norfolk Honey Company in the UK. They have a range of helpful videos for all levels of beekeeping experience on their YouTube channel “The Norfolk Honey Company” If you want to keep up to date with all of Stewart's beekeeping videos and find out more about beekeeping techniques, tips and tricks, feel free to visit his channel. We wish you every success with all of your beekeeping in 2017.